Welcome to the Hearth and Soul Blog Hop, the blog hop for recipes using healthy ingredients, family and comfort food recipes, articles about healthy living, real /slow/ local/sustainable food, foraging, herbal remedies, organics and gardening. Not long ago I was in New York City with my family celebrating our son’s 21st birthday and enjoying Our Favourite New York City Restaurants – but absolutely freezing in temperatures well below zero. This week I’m in Israel experiencing sunshine and temperatures in the 70’s Fahrenheit (the 20’s Celsius). Quite a difference in the weather that is for sure! Once again I’m enjoying some great food, amazing sights and getting lots of inspiration for future blog posts. I’m so grateful for these experiences. I spent this morning in beautiful Jaffa, Gateway to the Ancient World. Today I’m featuring tasty appetizers – perfect for Game Day! 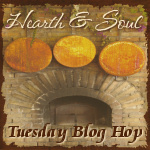 Please share the Hearth and Soul Hop badge to help promote our hop! Don’t miss out! Sign up for my weekly newsletter in the box below the comments and never miss a post. Glad you enjoyed your very cold trip to the States. You have a great collection of appetizers for the big game day. I am sharing on of our favorites bean recipes today, Rancher Beans. Thanks so much for hosting a great party! How exciting Israel after NY. Israel has always been a place I wanted to go to… I almost went when I was in Egypt…but that is long story. Glad you enjoyed the restaurants of NYC… so many good ones to choose from… is you come back for a blogging conference or a lady’s trip let me know I will bring you to a few hot spots. April, you do get around! My recipe for Coca can also be used as an appetizer when cut into smaller pieces. Thanks for hosting! Wow! How exciting! May I live vicariously through you? I’ve always wanted to go to Israel. I hope you share lots of pictures with us! Thank you for hosting the party, April! My pleasure! I feel so lucky to be here, Min 🙂 I’m definitely planning some posts about the trip. What a fabulous collection of deliciousness you have here! Today I shared: Savory Leek Potato Vegetable Soup, Warm Asparagus Spears with Pine Nuts and Baked Marinated Portabello Mushrooms. Your posts sound delicious – I look forward to visiting! Thank you for sharing with us at the Hearth and Soul hop.